At the end of summer, kids whose schools had not yet started for the year were out today with their parents (mostly dads, it seemed) on the water of the Currituck Sound here in Duck, N.C. learning how to fish for crabs, stand-up paddle board, and kayak. This was not a day for hurrying, and it was not a day for news. Soon it will be back across the long narrow bridge to the world of endless distractions. But today there was little to do but float with the wind and current in a small yellow kayak, with a bit of paddling needed to get nowhere in particular. 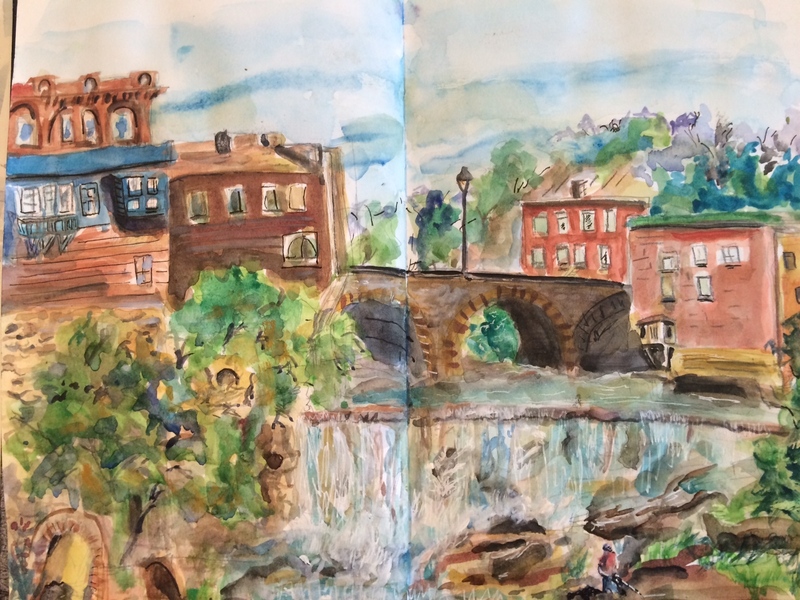 In the waning days of summer, it is a treat to have time to explore some old American towns, including ones I’ve seen before but now yielding new perspectives. 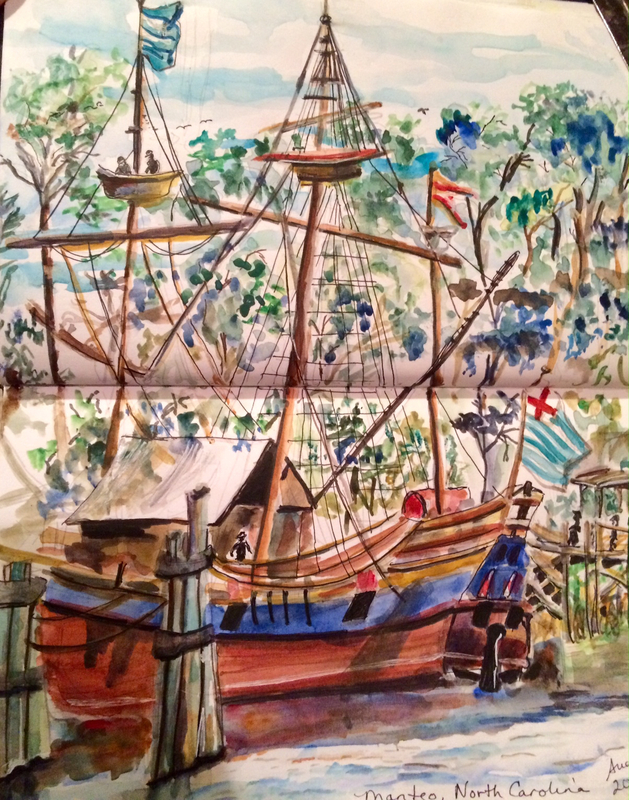 From the waterfront in the small town of Manteo, North Carolina, for instance, it’s impossible to miss the colorful sailing ship just across the water. 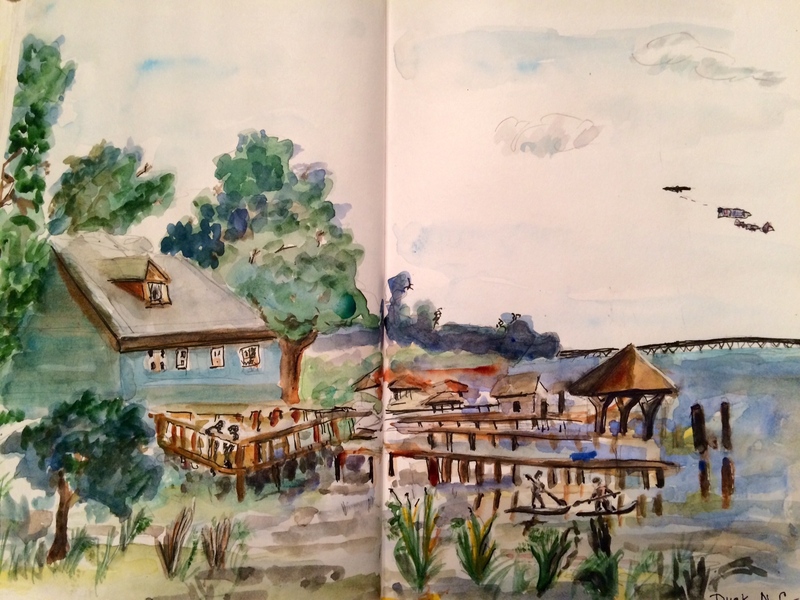 Today, while enjoying the breezes blowing through a large gazebo right on the water, it was possible to sketch and paint while watching boats come and go through the inlet of Shallowbag Bay. More than four hundred years ago, a fleet of such colorful sailing ships arrived near this very spot. The “Elizabeth II” is a replica of Sir Walter Raleigh’s flagship in the fleet of seven under his command when he brought colonists in 1584 to settle in the region of Virginia. The colonists ended up (at least with respect to the known settlement) going no further than Roanoke Island, where Manteo is located. Already living here at that time, of course, were native American Indians, namely the Croatan tribe believed to be part of the larger Carolina Algonquian tribe. In Sir Walter Raleigh’s first group of colonists was an artist, John White (who later became the new colony’s governor), who recorded scenes of native American life in watercolors. 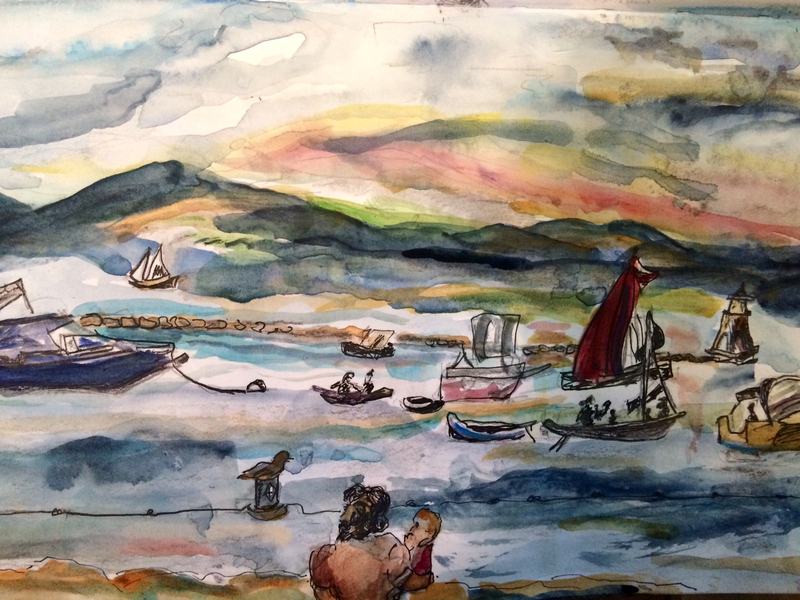 White’s watercolors, now in the British Museum, were the first visual record the British people received of the people, customs, and the flora and fauna of the newly discovered land. What happened next is both better known and unknown; White returned to England to get help for the new colony and the colonists who remained behind, including his daughter and infant granddaughter, faced an uncertain future. They were never seen again by Europeans, leading to the story of the “Lost Colony” and a mystery which remains unsolved today. Recent discoveries suggest, however, that the colonists may have divided into two groups and assimilated into friendly native Indian tribes in areas beyond Roanoke Island where they had first landed. Discoveries, encounters, blending, observations, perspectives, and “lost colonies”–all topics to be returned to this fall when this blog resumes its original ‘focus’ (as per the “About” page!) about challenges involved in adapting to new circumstances. 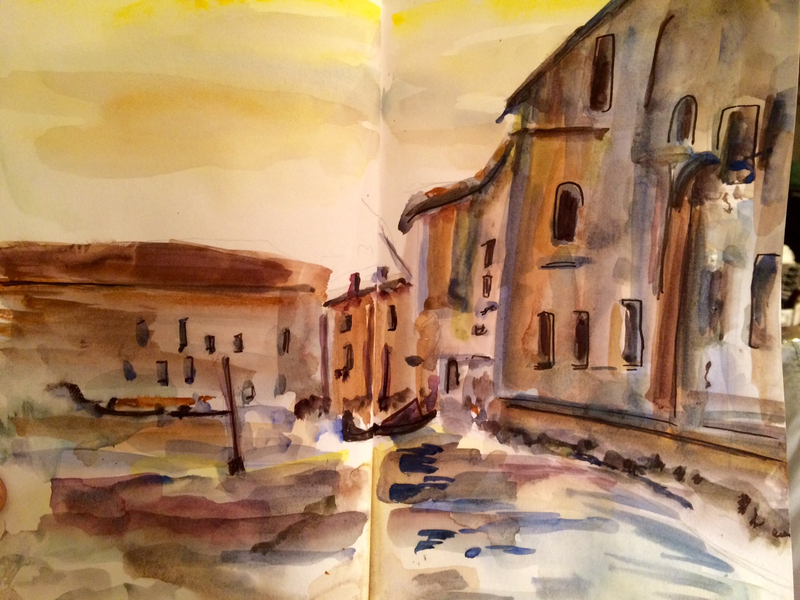 Learning about light and reflection is key in watercolor and drawing generally, and is a real challenge. John Singer Sargent, the portrait artist and later watercolor painter, recommended: “Above all things get abroad, see the sunlight, and everything that is to be seen, the power of selection will follow.” (See essay “Sunlight on Stone” by Teresa A. Carbone, Andrew W. Mellon Curator of American Art and Managing Curator, Arts of the Americas and Europe, Brooklyn Museum, in John Singer Sargent Watercolors published by Museum of Fine Arts, Boston and the Brooklyn Museum in 2013-2014). In some of his paintings, Sargent seems only to paint the reflected surfaces and darker contrasts, skipping any outline or sketch. His work as a watercolorist shocked many of the critics of his time, according to Erica E. Hirshler, the Croll Senior Curator of American Paintings in the Museum of Fine Arts, Boston, in her essay, “Sargent’s Watercolors: Not for Sale” (also found in John Singer Sargent Watercolors.) This is an excellent book, by the way, with informative clearly written essays by multiple art historians, and numerous color and black-and-white plates of Sargent’s paintings. Hershel writes that “the difference between Sargent’s approach to watercolor and the British watercolor tradition was profound…” [in the early 1900s]. 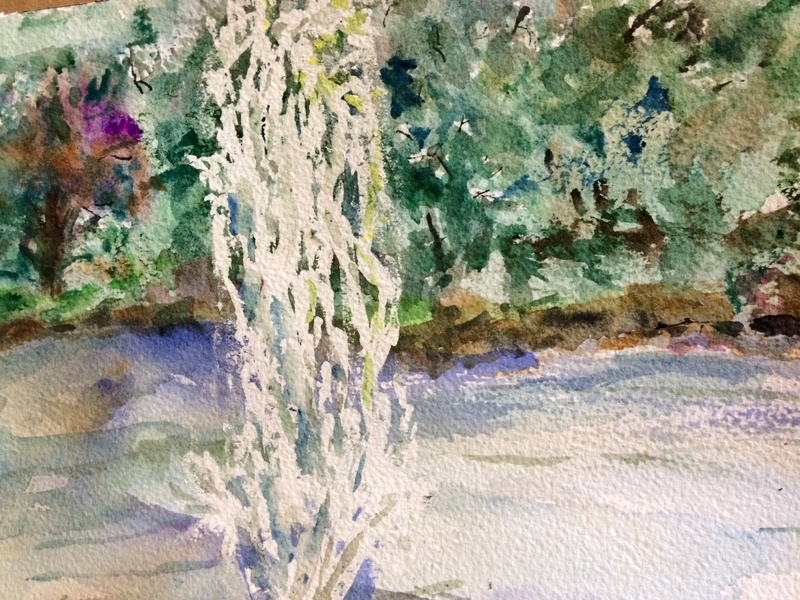 “The convention called for carefully delineated and composed landscapes enlivened with transparent washes of color.” At the time, a reviewer of Sargent’s works noted that his “seeming carelessness of touch is really controlled by the most correct judgement and by the acutest perception of relations of tone and color.” Sargent’s watercolors, said another art critic at the time, were “a bewilderment to men of an older, more staid school.” And, more than a century later, they continue to pose challenges, as well as guides, to those wishing to enhance their observation and imagination skills. Traveling can be tiring but recent experience suggests it’s worth it if the destination is Vermont. From the hectic tension of airport travel, the scene at Isle La Motte, for instance, up by the Canadian border, and the site of the French explorer, Samuel de Champlain’s, landing in 1609, could not be more different, nor more relaxing. This is a spectacular setting with energizing breezes, bright sunlight–no humidity!–waterfront and beaches all around, and small white caps and sailing ships in the distance. 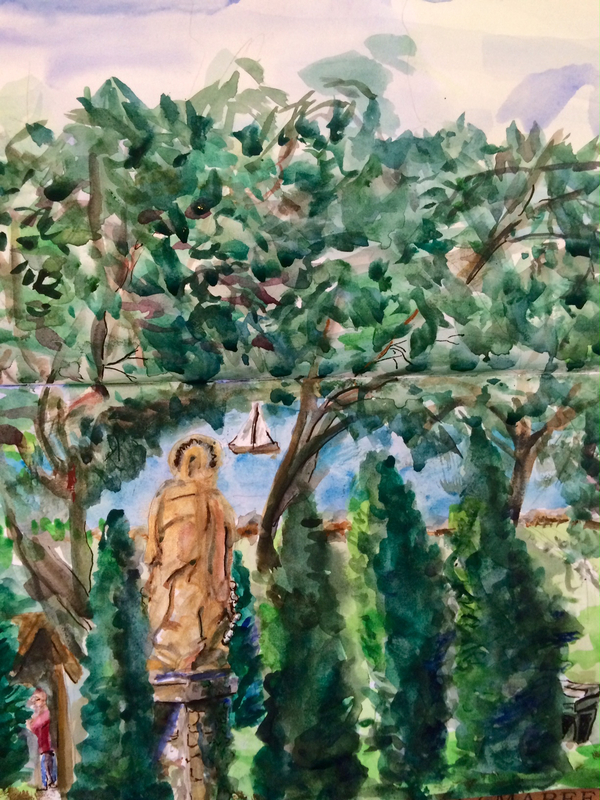 On the grounds of the Shrine of St. Anne–which faces the water and has only outdoor seating for its congregation–a beautifully landscaped lawn features grottos and a golden statue of Our Lady of Lourdes also facing the lake. From there along the shores of Lake Champlain to the waterfront of Burlington, the views are wonderful. In town, of course, it becomes quickly evident that Burlington is a place that takes its beers, bistros, and B&B’s very seriously! Not far away are more beautiful sights, including the Otter Creek Falls in Middlebury, Vermont. There’s a lot more to see (and sketch) but there’s never enough time to do everything. Hopefully there will be another occasion to take in the views along Lake Champlain. 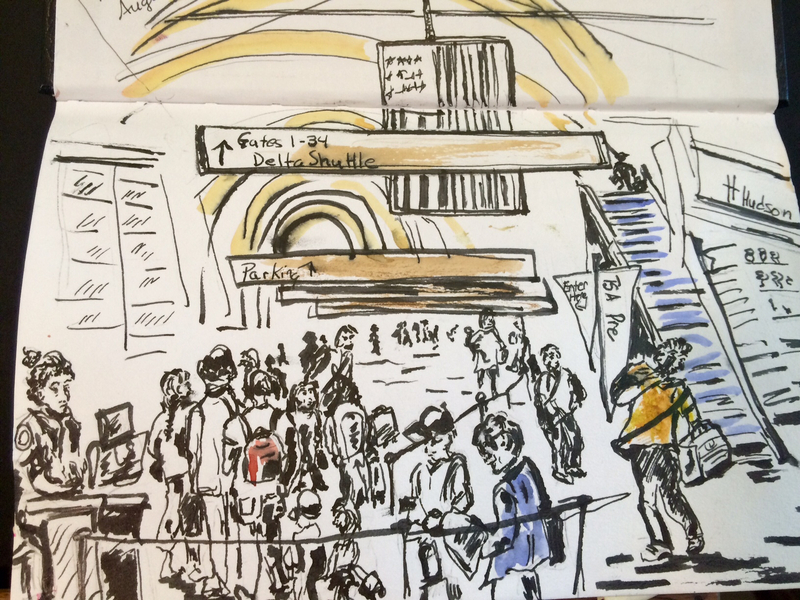 On a hot day in Washington, D.C., a bunch of us went underground–to sketch! Our destination was (and is) not open to the public yet, and–having been there–it’s clear that it’s not a public venue for good reasons. 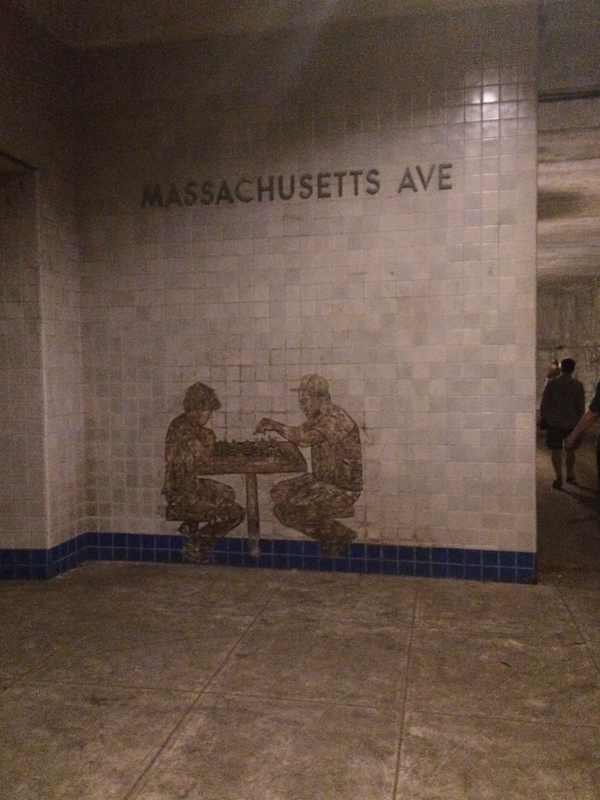 The “Dupont Underground” is a large former trolley station (opened in 1949) and food court immediately underneath Dupont Circle. There are plans underway for its restoration, but it’s going to take some time, clearly. Other than serving as a bomb shelter (if needed), this space hasn’t been in use now for decades. The new management has bold ideas for it, basically illustrating the concept of the “adjacent possible” described earlier on this blog (a concept attributed to innovation author and expert, Stephen Johnson, in his book, Where Good Ideas Come From). It’s a bit unnerving to go into such a dark, dank space, and bold to even think about sketching it, probably. The air was humid and a bit gritty. Tunnels stretched out in multiple directions, pitch black. Most of us stayed in the dimly lighted areas. A few who were not intent on sketching and who were equipped with flashlights ventured into the gloom. 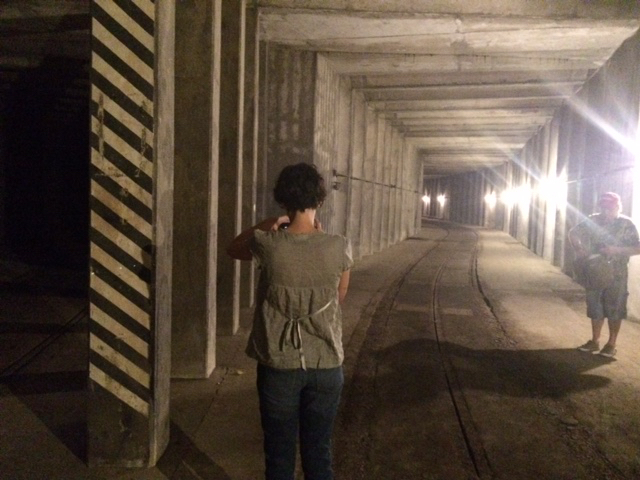 The rest of us tended to mass together towards the end of one tunnel: this was not a place you really wanted to be alone in! There we worked in nearly total silence; the loudest noise was the sound of sketchers’ pencils shading in areas of sketches. Afterwards, it was a relief to get back above the surface again, into the strong, swelteringly hot sunlight of a Washington, D.C. afternoon in August! Some of us will wait until the underground is spruced up a bit more before venturing back to see it again! 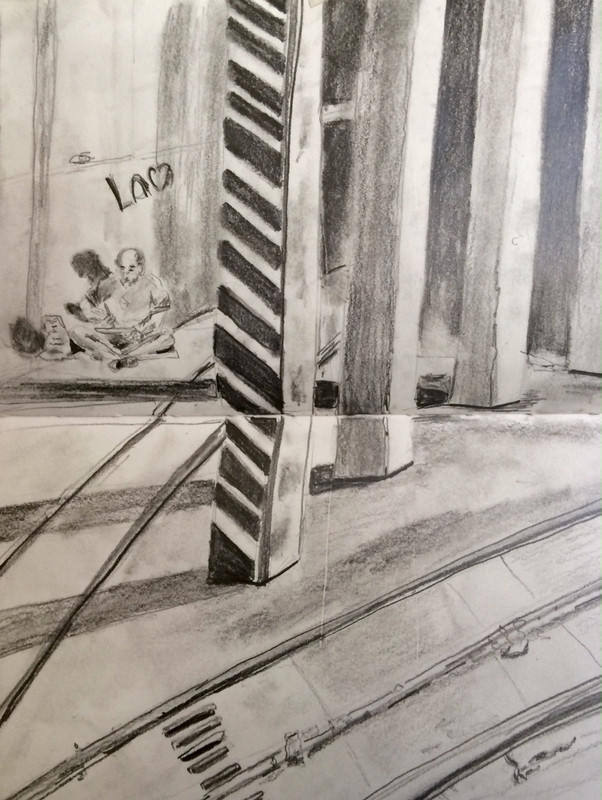 Illustration: Sketchers underground in Washington, D.C.
You always see something new even in a visit to the Phillips Collection (smaller than the National Gallery, for instance) in Washington, D.C. During a recent visit, the paintings by Raoul Dufy fascinated me. 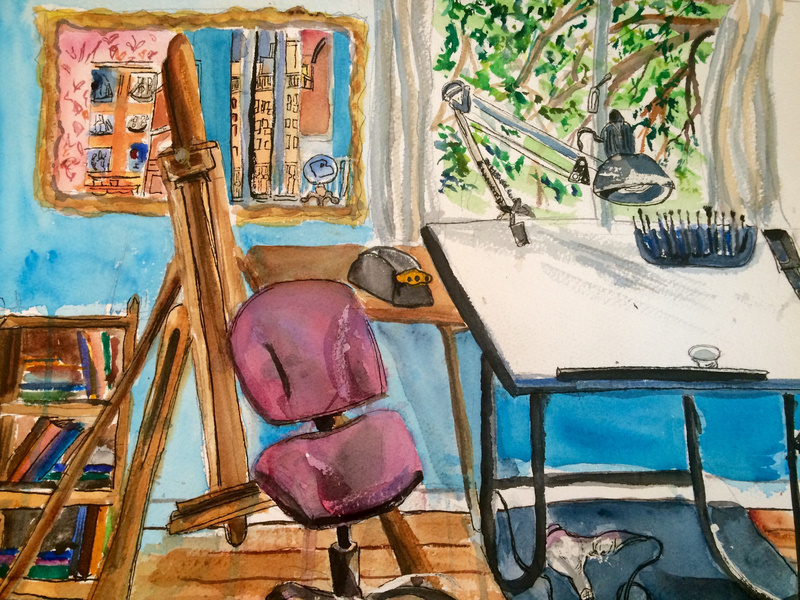 This watercolor of mine below is inspired by his painting called “Artist’s Studio”, which he completed in 1935. ( It reminds me that there is much still to uncover about Frame Innovation: New Thinking by Design, a book about design thinking which I touted on this blog a few months ago.) So, before long, this blog will return to the issue of “frame innovation”–which seems to have a lot to do with how to compose a picture, design a room, or develop clarity about complex things like, for instance, foreign policy! Let’s see what you think about design thinking!